In a fix and need roofers to help? Up in Glasgow, our chimneys get the brunt of the bad Scottish weather. This is why it's smart to check for cracks, breaks and leaks before the problem escalates. We're specialists in chimney repairs and re-pointing, so don't worry. Get in touch today to find out how little peace of mind could cost you. We can repair the stack, replace the flashing, secure loose parts, carry out re-pointing and close up unused flues to keep out cold draughts. Whatever you need doing, you can be sure that our expert roofers are the ones to ask. When something goes wrong, you need a roofer you can trust. Our Glasgow team make up a reliable, local company that can help you straight away. We take pride in what we do, so we always provide Glasgow with a good service when it comes to chimney repairs. 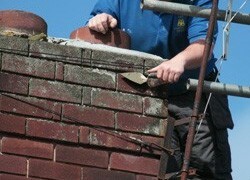 Call us to discuss your chimney repairs, re-pointing, draught blocking or general maintenance. Dial 0141 340 9604 - our friendly staff are waiting to hear from you. Our roofers can offer you a free no obligation quotation for your Glasgow roofing job.